While I think that bicycle boulevards and bike lanes and traffic calming devices are all terrific and mookproof, there are those, namely mooks, who would disagree. And, admittedly, I completely understand their arguments. Besides representing change, these sort of modifications fly in the face of our culture of speed. We've gone to great lengths to increase speed. We measure the efficiency by which people move in a space by throughput. So, regardless of how many cyclists can fit in the space of a car or pass during the phase of a traffic light, the mere fact that a bicycle can't travel at the same speed is seen to make it inferior. Fair enough. But there are infrastructure modifications, small ones, that even the gas-guzzlingest, most horsepowered, all weathered traction, multi-climate zoned, moon-sun-and-star roofed, xenon death-of-a-star headlighted, mook of all time can appreciate. Back-in/reverse angle parking is a genius solution. Instead of nosing right in like a hummingbird, the direction of the parking spaces is reversed and you back in. Now you don't scrape your chin all over the curb, it's easy to load up all your shoppings, and you can enter traffic much more easily. It's a super quick, super cheap, super fast fix remaining unimplemented by virtue of it's own obviousness--"there must be a good reason we're not doing it." It's like the metric system or green, pictogram exit signs. 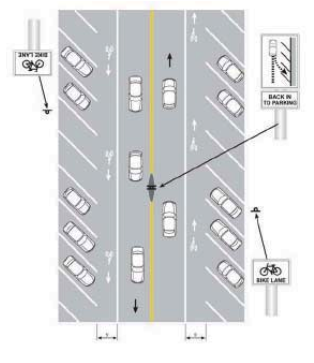 Courtesy of the Austin Bicycle Master Plan.